All-you-can-eat takes on new meaning! I've heard about Fogo de Chao for several years. Friends would go there, gorge themselves on the food and come back with glowing reviews. It sounded good and I was certain I would like it, but the cost kept my husband and I away for a long time. I enjoy a good meal like anyone else, but I hate paying a big chunk of money for it. So when Devour Downtown came around and it was also our anniversary, we decided to take advantage of the lower priced special event menu and headed downtown to Fogo de Chao. 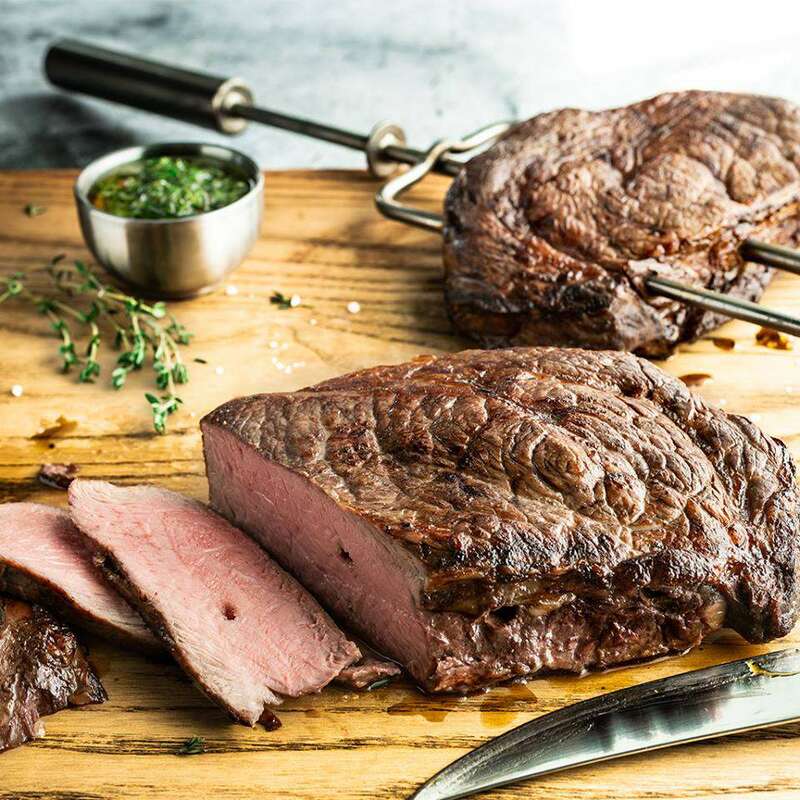 Located at 117 East Washington Street in downtown Indianapolis, Fogo de Chao (pronounced fo-go dèe shoun) is an authentic Brazilian steakhouse. The restaurant is located in the former Zipper Building, which gets its name because it resembles a zipper. It is located in a nice, downtown area full of restaurants and shopping. Inside, Fogo de Chao has the upscale feel you'd expect from a fine restaurant. The tables are dark wood and covered in white tablecloths and napkins. As you walk in, a beautiful bar is directly to the right. Inside the restaurant, a large salad bar sits in the middle of the dining room and a large wine wall covers an entire section. The walls feature Brazilian-style murals. My husband and I visited Fogo de Chao on a Wednesday night during Devour Downtown. The two-week event happens twice annually and offers heavily discounted three-course meals at many popular (and often, upscale) restaurants downtown. The idea behind the event is to promote restaurants that residents might not try without the discount. So needless to say, this was not the typical weekday night there. We called during the day and the hostess explained to us politely that they were completely booked but we should feel welcome to come and wait for an opening. So, that's what we decided to do. When we arrived, there were several groups waiting to eat and we were informed the wait could be up to two hours, but that it wasn't likely it would be that long. Without kids, such a wait didn't seem so daunting, so we took a seat in the bar. We were greeted warmly by the two bartenders who introduced themselves (sorry, I don't recall the names) and immediately made drink suggestions. We were happily seated within about 20 minutes of arriving, so we were very glad we'd taken the chance of showing up with no reservations. I noticed there were many large groups, so I think our party size allowed for quick seating. Our small two top table was located near the salad bar and against the wall. Fogo de Chao is different from other restaurants because while you have a server, you also have a team of staff bringing various foods to your table at all times. So while our server was great, we didn't see him too often. He announced up front that they all worked as a team, so feel free to ask anyone if we needed anything and it did seem to work that way. We had no shortage of people assisting us and we were never without drinks or food. The staff was all very professional and polite, without being stuffy. They were personable and attentive and all diners seemed to be happy. They were also incredibly busy, so given how packed the restaurant was, I would say they rose to the challenge easily. Fogo de Chao is not like a typical restaurant. They specialize in style of preparing meat referred to as the gaucho way. Fogo de Chao serves 15 cuts of meat and the chefs bring them continuously to each table. The entrees come delivered on large skewers on which they are grilled and the gaucho chefs slice off a piece cooked to your preference. Diners are provided with a card which is green on one side and red on the other. Flip to green if you are ready for more food, red if you aren't. There's no limit to the food and they do serve slices of meat in small portions so you can try many. The meal begins with the limitless salad and sides bar which is a gourmet experience. The salad bar features fresh mozzarella, salmon, prosciutto, many side dishes and large variety of veggies and lettuces. The meal also includes limitless service of traditional Brazilian side dishes, including: pão de queijo (warm cheese bread), crispy hot polenta, garlic mashed potatoes and caramelized bananas. The only portion of the meal that isn't included in the price is dessert. Fogo de Chao offers a variety of desserts which include their signature papaya cream, South American flan, crème brule, turtle cheesecake, molten chocolate cake and key lime pie. This review is a little different from others that I've written simply because the restaurant is different. The meal is pretty much the same every time. The experience is changed with the selection of different meats or creating a different salad for yourself. There's also some choices to be made with drinks and desserts. While neither of us are big drinkers, it was a special occasion, so we each decided to try something different. The bartender suggested their signature drink, the Brazilian caipirinha. The caipirinha is the national drink of Brazil and is made with cachaça (sugar cane rum), sugar and lime. I took his suggestion and ordered that and my husband ordered a blue caipirinha, made the same except with blue curaçao added. The Brazilian caipirinha reminded me of a margarita. It had a very strong lime taste and despite the sugar traditionally added to the drink, it was still a bit sour for me. My husband's drink was also very strong, but he liked it. At $12 each, I guess a strong drink is appropriate. We sampled nearly every cut of meat that Fogo de Chao offers. Our favorite was the Picanha, which is the prime part of the sirloin. It is seasoned with sea salt and flavored with garlic. The chicken was very flavorful as well. And if you like lamb, you won't be disappointed. My husband really liked the Linguiça, a robust pork sausage. We both thought the filet was boring. Because the filet offers very little fat, it seemed to have lost a lot of its flavor as well. As long as we kept the green side of the card showing, we were offered many options. When they repeated some of the same ones, we simply declined. The chefs even asked what we would like to try and we were able to request some of the meats that we hadn't tried yet. For the most part, the meats were flavorful and excellent cuts. The traditional Brazilian side dishes offered were all good. They bring all four to the table and replenish throughout the meal. We both loved the cheese bread. The garlic mashed potatoes were so good we went through two helpings. I liked the polenta but my husband thought they were tasteless. When eaten with the flavorful meat, it added a new element. The caramelized bananas were good. To me, they were almost like a dessert and didn't seem to work as a side dish. During Devour Downtown, dessert is included with the meal. Normally, this is not the case. So, if you are able to control yourself enough to save room for dessert, Fogo de Chao does offer a wide selection. I tried the crème brule and it came out perfectly with the carmelized sugar topping. It was very sweet and light at the same time. I enjoyed it immensely but couldn't finish it. It was a generous portion after such a generous meal. Our server offered my husband a slice of cheesecake with strawberry topping, which he said was very good as well. Neither one of us tried their signature papaya cream dish, but it gets rave reviews. Lunch at Fogo de Chao is $26.50 per person and $19.50 for just the salad bar. If you're dining at dinner, expect to pay $46.50 for the entire meal. The price for the dinner salad bar alone is also $19.50. Children 5 and under are free. Children ages 6 to 10 are half price. Eating at Fogo de Chao was a fun experience. The food was good and it was a nice atmosphere. The staff was friendly and helpful. When I eat at a restaurant this pricey, I have very high expectations. Food preferences are personal, so it's always hard to judge. I like distinct seasoning on meat. The gaucho style is all about bringing out the natural flavors of the cuts of meat. So they use salt and natural seasonings. While the meat was all good, I think I would have preferred a bit more flavor. I loved the sides and desserts we tried. That being said, if I was going to pick an expensive, upscale restaurant, I am not sure this would be my first choice. While you do get a lot for your money, there's also only so much you can eat. At least at other restaurants, I usually leave with enough food for another meal.